Correspondence from key city officials after the massive sinkhole opened up reveal a scramble to control the situation — and the message. 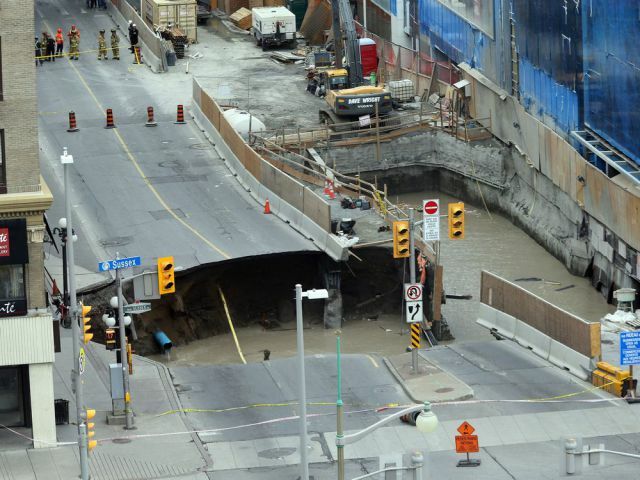 In mid-morning June 8, a gigantic sinkhole opened up in the middle of Ottawa‘s busiest shopping district. When I say gigantic, the sinkhole was big enough to swallow a van. Luckily, no one was injured or killed. But the sinkhole broke gas mains, disrupted electricity to nearby businesses and close down one of the busiest intersections in Ottawa for several weeks. It also flooded the tunnel for auto was new LRT line, which was being bored beneath the location of the sinkhole. Ottawa Council was sitting at the time of the incident. And you can only imagine what went on behind the scenes as the Mayor and Councillors pressed city staff and emergency workers on the scene for information to respond to news media questions. Well, actually, you can do more than image it. Thanks to the Ottawa Citizen, which filed an Access to Information request for the communications relating to the incident. The City of Ottawa delivered texts from email and twitter. On Friday, the Citizen published the verbatim highlights of the communications between the Mayor, Councillors, staff and contractors. And it makes interesting reading for anyone working in a communications position who have yet to have their first experience in real life crisis communications. This really was a “near miss.” Two city buses passed over the road only minutes before it collapsed. In a world in which citizens provide witness to remarkable events, it was ironic that one of the first people to post a picture on twitter was a CTV weather announcer. Some days, you’re just in the right place at the right time. Trolls will be trolls. Amidst the otherwise dry exchanges of information are a couple emails best not responded to. One writer copies Ottawa Jim Watson on an email addressed to Ontario’s Premier Kathleen Wynne sarcastically comparing Ottawa’s sinkhole to the province’s Climate Change Action Plan. In the midst of things, you just have to find a moment to smile. One city staffer found humorous relief forwarding an article in The Beaverton that attributed the sinkhole to the weight of people waiting in line to use the bathroom at a nearby McDonald’s. Bottom line: the emails give a good picture of a system working as it should. Contractors and staff getting to the bottom of things and working to fix them. Politicians responding to the public and media. A classic case of finding focus in chaos.